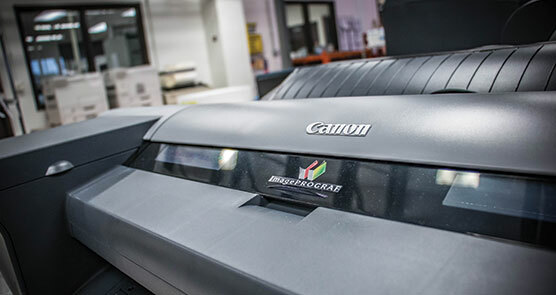 Canon has partnered with RIT to perform media testing to verify compatibility with the imagePROGRAF line of Large-Format printers. – Achieve certification for imagePROGRAF devices including: iPF9400S, iPF6450, PRO-1000, PRO-2000, and PRO-4000S. (Media certified on the iPF9400S is also certified on iPF6400S/8400S/9400S printers. Media certified on iPF6450 is also certified on PF6400/6450/8400/9400 printers). –With the large variety of media types available to Large-Format printer users, confirmed and certified compatibility with imagePROGRAF helps guarantee print quality and runnability. – Following certification, apply to join the CAPP co-marketing program in partnership with Canon. If accepted, your company becomes an official CAPP partner and enters into an ongoing relationship with Canon with opportunities to jointly promote your media’s compatibility with imagePROGRAF. RIT is currently accepting online requests for performing all Canon media certification. The base price per media for the 1st device is $630 plus $550 for each additional device with the same media. An additional $400 is required for each media/printer combination when the AM1 file is not provided by the paper manufacturer. RIT requires a minimum size of either a 12” roll (iPF9400S or iPF6450) or 8.5x11” cut sheet (PRO-1000) to perform a certification. Please supply a minimum of 100 feet (or 100 sheets for the PRO-1000) of material for each printer being tested.